The museums of Dresden date from the latter half of the sixteenth century, when rulers of Saxony, known as electors because they were among those who elected the Holy Roman Emperors, began to assemble works of art. Frederick Augustus I (1670-1733), who reigned in Saxony from 1694 to 1733 and ruled in Poland as Augustus II “the Strong” from 1697 to 1706 and again from 1709 to 1733, had the architect Matthäus Daniel Pöppelmann (1662-1736) build the Zwinger. In the nineteenth century, the architect Gottfried Semper (1803-1879), who designed Dresden’s Semper Opera, renovated the structure and added what now is known as the Semper Gallery. During the irresponsible Allied bombing of Dresden in February 1945, the cultural heritage of the city suffered tremendous damage. Fortunately, most of the priceless items were in safe storage, but many other articles were lost. Over the years, the damage to the museum buildings has been repaired, and Dresden once again is among the world’s most important cities for museum goers. A view of Dresden from the Elbe River shows (from left to right) the Ständehaus (Court of Appeals), the Residenzschloss (Residential Palace, also known as the Dresden Castle), the Catholic Hofkirche (Court Church), and the Augustusbrücke (Augustus Bridge). A portion of the Semperoper (Semper Opera) appears roughly in the middle of the Augustus Bridge. Few visitors to Dresden realize the links between the city and Prague in the Czech Republic. The Czech composer Jan Dismas Zelenka (1679-1745) spent the last 35 years of his life in Dresden. The German composer Carl Maria von Weber (1786-1826) was the director of the opera in Prague from 1813 to 1817, and Weber married in Prague before going to Dresden to direct the opera there (his grave is in Dresden). One of the tributaries of the Elbe is the Vltava (German: Moldau), which runs through Prague, and in 1841, the first commercial paddle-wheel steam boat traveled the rivers between the two cities. 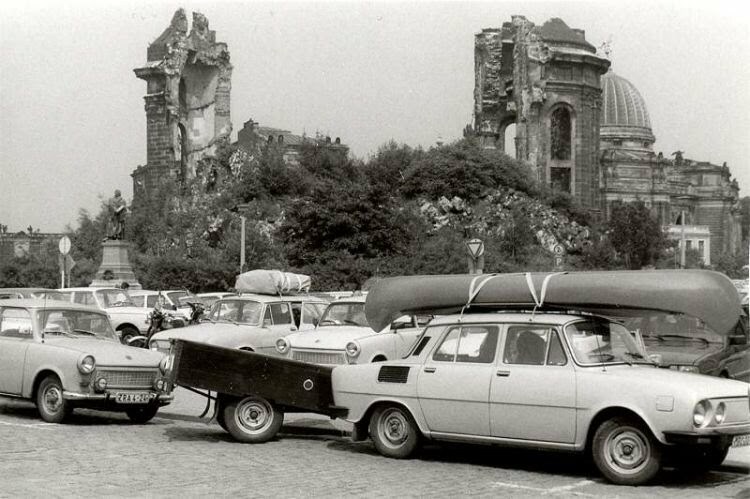 Then in 1945, refugees from the Allied bombing in Dresden fled to Prague. Deutsches Hygiene-Museum (German Hygiene Museum), featuring a famous collection that began to be assembled shortly before the First World War that is housed in a building from 1930 by the architect Wilhelm Kreis (1873-1955). The web site is at http://dhmd.de/index.php?id=204. Militärhistorisches Museum der Bundeswehr (Bundeswehr Military History Museum) is the military history museum for the Federal Republic of Germany. The architect for the restoration of the building and its modern addition was Daniel Libeskind (born 1946), who designed the reconstructed World Trade Center in New York City as well as the Jewish Museum in Berlin. The web site is http://www.kommando.streitkraeftebasis.de/portal/a/kdoskb/weitdstst/mhm (there are no English pages). Senckenberg Naturhistorische Sammlungen (Senckenberg Natural History Collections of Dresden), formerly the Museum of Zoology and the Museum for Mineralogy and Geology. The Dresden museum is part of a three-museum network known as the Senckenberg Gesellschaft für Naturforschung (the other facilities are in Frankfurt and Görlitz). The German website for the Dresden branch is http://www.senckenberg.de/root/index.php?page_id=4774, and the English pages are at http://www.senckenberg.de/root/index.php?page_id=647&standort=true&standortID=2. Staatliche Kunstsammlungen (State Art Collections) in Dresden has a total of twelve museums in various locations of the city. For information on the Internet, see http://www.skd.museum/en/ and take the virtual tour of the Green Vault, Turkish Chamber, Porcelain Collection, and Old Masters Picture Gallery at http://www.skd.museum/fileadmin/panoramav103/. See the category “Museums and Institutions” for web sites describing the specific collections. 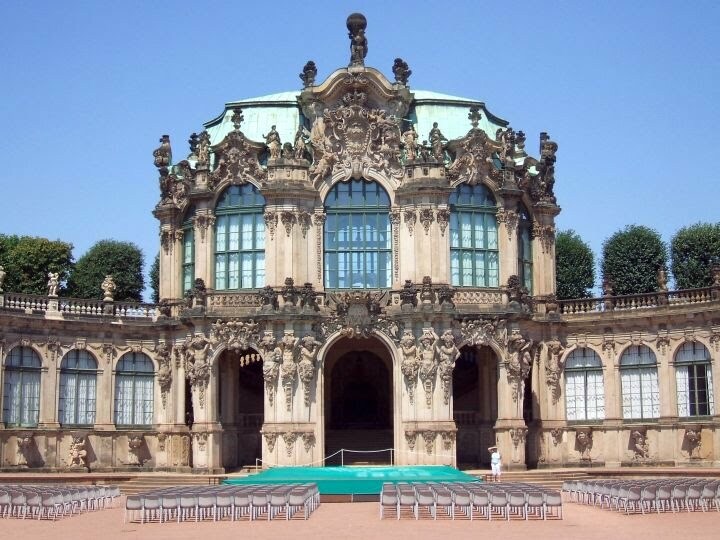 The museums in Dresden are housed in several buildings: Albertinum, Zwinger, Residential Palace (or Dresden Castle), Pillnitz Castle, Japanese Palace, and the Hunting Lodge. Special exhibits are placed in the Kunsthalle im Lipsiusbau. There is a yearly pass for the museums, aside from the Green Vault, that is equal to the cost of the entrances to four museums. There are limits to the number of visitors permitted in the Green Vault, so it is best to make a reservation, which is possible to do on line, to ensure a place. Stadtmuseum Dresden (The Dresden City Museum) features the history of Dresden. The museum’s web site is at http://www.museen-dresden.de/index.php?lang=en&node=home. Verkehrsmuseum Dresden (Dresden Transport Museum) at the Johanneum has a web site at http://www.verkehrsmuseum-dresden.de/en/. The Wallpavillon of the Zwinger. Just a short walk from the Residential Palace, also known as the Dresden Castle, is the Rococo style Zwinger Palace, which the architect Matthäus Daniel Pöppelmann (1662-1736) built between 1710 and 1728. Today it is one of the most important museums in Europe. The Allied bombing of February 1945 heavily damaged the structure, but the government of the German Democratic Republic invested millions of Marks in its restoration. In 1952, the first museum in the complex reopened--the Mathematics and Physics Salon, which includes one of the calculating machines of Blaise Pascal (1623-1662). It was not until 1963 that workers completed the last portion of the Zwinger. Three museums--Old Masters Painting Gallery, Cabinet of Mathematical and Physical Instruments, Porcelain Collection--are located in the Zwinger. The most famous work at the Zwinger is the Sistine Madonna and Her Angels, by Raphael (1483-1520). Few know the 500-year-old masterpiece, but many recognize the two pudgy angels with their starry-eyed gaze toward heaven that grace coffee mugs and inexpensive wall hangings around the world. Dresden, the capital of Saxony, ranks among the main culturally and architecturally rich urban centers of Europe. The Saxon ruler Frederick Augustus I (1670-1733, reigned in Saxony 1694-1733 and in Poland as Augustus II “the Strong” after his conversion to Catholicism, 1697-1704 and 1709-1733) expanded the city and built a number of important structures, including the Zwinger (1710-1728) and the Catholic Hofkirche (Court Church, 1738-1751). Frederick Augustus commissioned the church after the Lutherans began building the Frauenkirche (Church of Our Lady, 1726-1730), a venture Frederick Augustus also helped to fund. In the many years that followed, additional building projects added to the city’s cultural heritage, and its museum collections became world famous. As the Second World War drew to a close and the Red Army approached Dresden in 1945, the British and American bombers destroyed the center of the city in an operation known as Thunderclap. The purpose ostensibly was to weaken the city’s defenses, but the city’s anti-aircraft guns were moved to protect nearby oil refineries. Furthermore, the British and Americans did not hit strategic targets, such as railway lines and the Autobahn. In reality, the plan was to increase the chaos in Germany, in part by disrupting the path of refugees from the fighting on the fast-advancing Eastern front. It also was to demoralize and punish Germany since the Western Allies often bombed the cultural centers of German cities. Some even speculate that Churchill wanted to attack the city in retaliation for the German 1940 bombing of Coventry. The Western Allies also wanted to demonstrate to the Soviets the power of their air forces. In two bombing raids on 13-14 February, 796 British Lancaster bombers and nine Mosquitoes dropped 1,478 tons of bombs and 1,182 tons of incendiaries on Dresden. On the morning of 14 February, 311 American B14 bombers dropped more bombs and incendiary devices on the city, and American fighters strafed the citizens fleeing the city. Some of the American bombers went off course, dropping the bombs on Prague by mistake. The firestorm over Dresden that resulted from the bombs, incendiaries, hot weather, and low humidity drew in surrounding air with hurricane-force winds up to 70 miles per hour. The fire then spewed out hot ash that set more buildings ablaze. The British and Americans knew exactly what they were doing. The first firestorm took place on 28 July 1943 in Hamburg, and others took place in Kassel in October 1943 as well as in March 1945 in Tokyo. The bombing in Dresden not only left the cultural center of the city destroyed but also resulted in the deaths of up to 25,000 individuals. The American novelist Kurt Vonnegut (1922-2007) was a prisoner of war in Dresden at the time of the bombing, and what he saw inspired his 1969 novel Slaughterhouse-Five or The Children's Crusade: A Duty-Dance with Death. In the years following the Second World War, the German Democratic Republic rebuilt many of the structures the bombing destroyed. One significant landmark that remained in a heap of rubble as a memorial to the destruction was the Frauenkirche. After the fall of the Berlin Wall in 1989 and the reunification of Germany in 1990, Dresdeners set out to reconstruct the church. Experts cataloged all the stones from the rubble and reconstructed the church from drawings and other documentation available about the church. Construction began in 1994, and in 2005 the church reopened. The dark stones from the original church that dot the facade serve as a stark reminder of the horrid experience of the charred city. Dresden's destroyed Lutheran Frauenkirche (Church of Our Lady) as it appeared in 1987. In the background is the Hochschule für Bildende Künste Dresden (Dresden Academy of Fine Arts), also affectionately known as the Lemon Squeezer.